Join us on February 22-24th for our annual Winter Retreat! 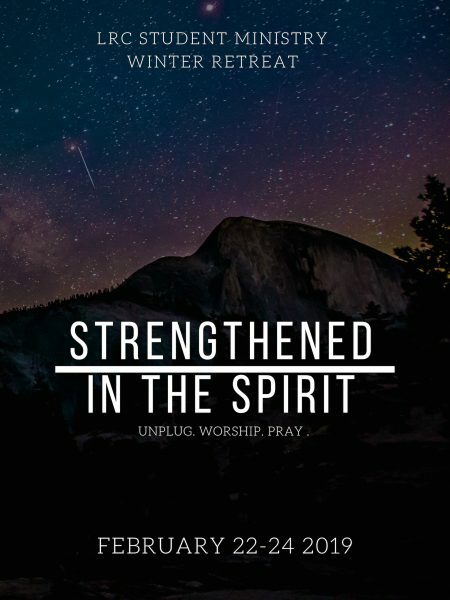 This Winter Retreat come and unplug from the social media and be present in Worship and in Prayer. There is a prayer in Ephesians 3 where Paul prays that we might be “strengthened in the power of his Spirit.” Not Paul’s spirit but the Spirit of God. He prays this so that “Christ may dwell in your hearts.” Allowing yourself some time to engage with prayer, worship, and scripture this weekend will give the opportunity for us to be strengthened together. Email address of person who would like to receive registration confirmation. Provide a cell phone number to contact you in case of emergency. List medications (doses, and instructions) your camper is taking during the retreat. If you are paying online, your card will be processed immediately when you click 'Submit'. If paying by cash or check, please bring your cash or check payment to church before the retreat. Either way, you will receive a confirmation email upon submission.